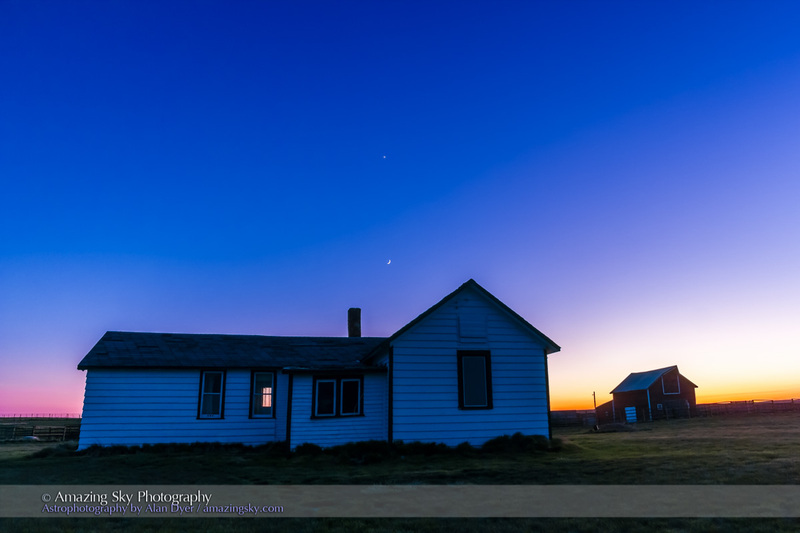 Skies were clear at dawn this morning for a fabulous view of the rare conjunction of three planets. And I could not have been at a more photogenic site. This was the view before dawn on October 25, as brilliant Venus and dimmer Jupiter shone just a degree apart in the dawn sky. Mars, much fainter, shines just below the close duo. The three planets could easily be contained in a high power binocular field. Not until November 2111 will these three planets be this close together again in a darkened sky. Indeed, Venus could not have been higher, as it is just now reaching its maximum elongation from the Sun, placing it high in the eastern morning sky. 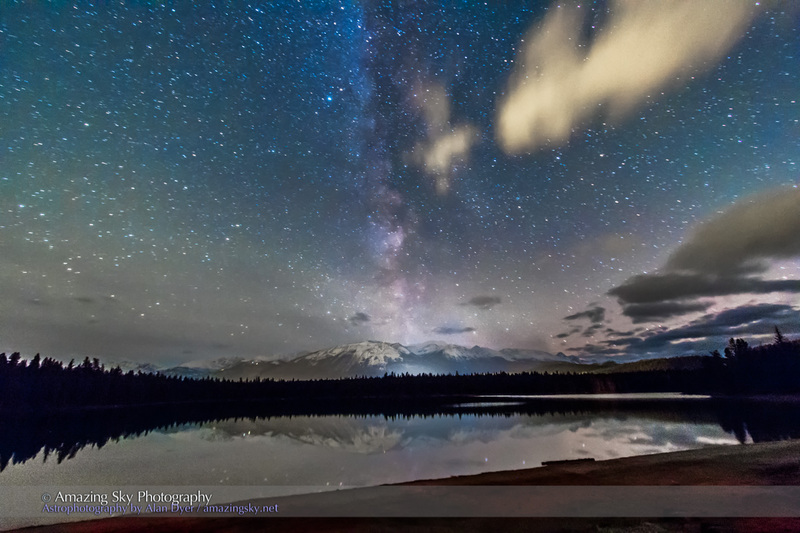 I shot from the shores of Lake Annette, site of one of the major events, the Friday star party, at the annual Jasper Dark Sky Festival which just concluded, in Jasper National Park, Alberta. 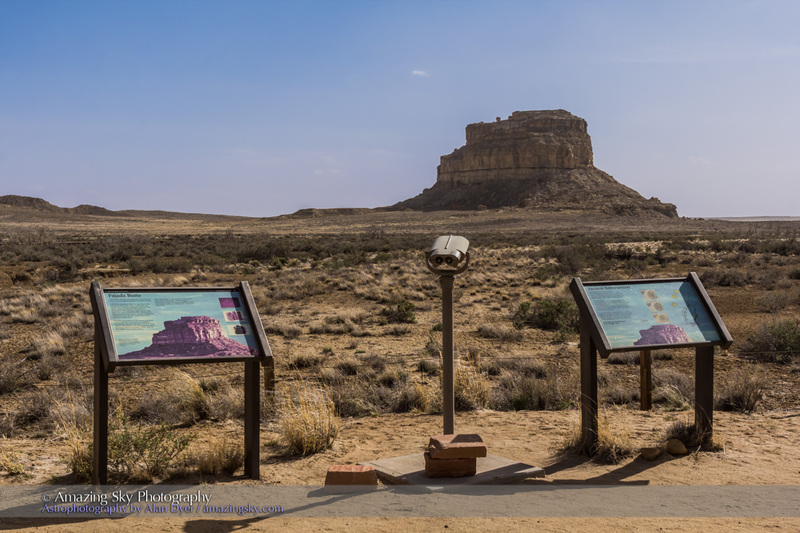 The Festival celebrates the Park’s status as one of the world’s largest Dark Sky Preserves. The hotels and restaurants were full with stargazers from around the world, making the Festival a huge success, both educationally and financially. I was honoured to be able to present some of the public and school talks. But this dawn sky was a fine way to end a fabulous weekend of astronomy. The image above is a panorama in the twilight, sweeping from the planets in the east, to the winter stars and constellations, including iconic Orion, in the south and southwest. Earlier in the morning, before twilight began to brighten the sky, I shot another even wider panorama from the south shore of the lake. 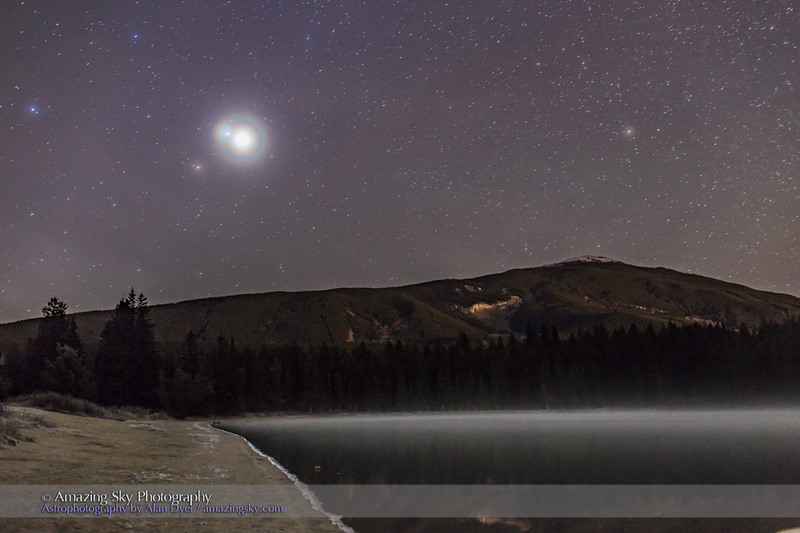 In this and other photos, high haze adds the glows around the stars and planets naturally. No special effects filters here! But Venus and Jupiter are so close and bright their images almost merge into one glow. 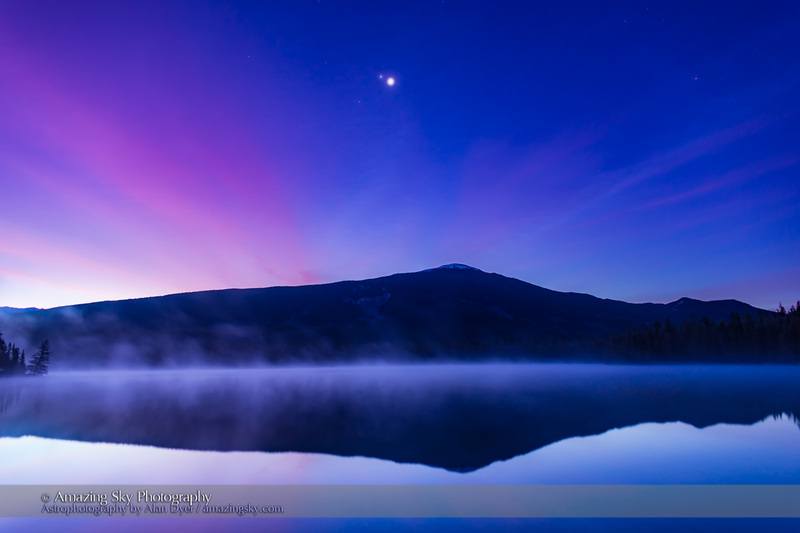 Here they are, with Mars below, shining in the dark sky over the Watchtower peak and over the misty waters of Lake Annette. Keep an eye on the sky at dawn, as these three worlds will be close to each other for the next few mornings. See my earlier blog for details. 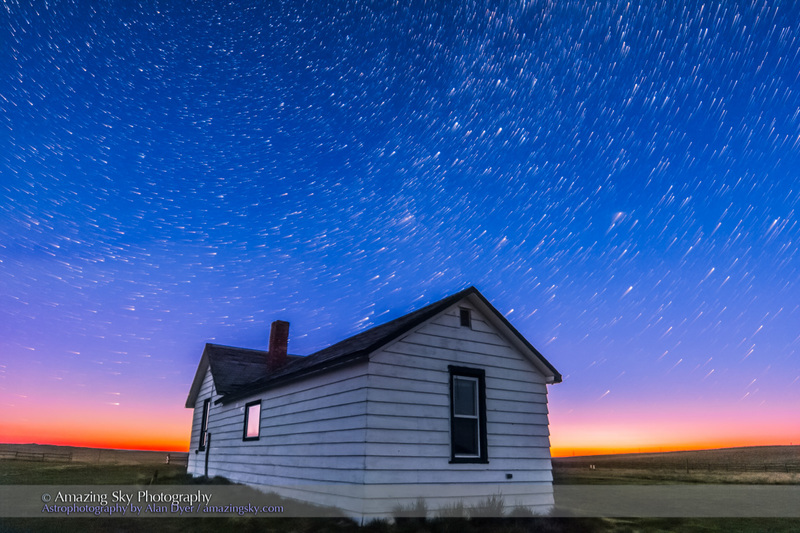 The skies were spectacular at a pioneer homestead on the Saskatchewan prairie. 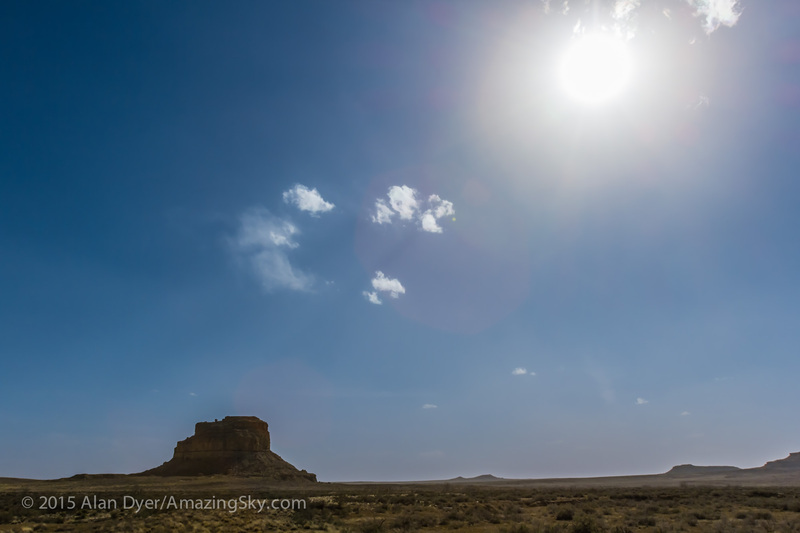 Canada’a province of Saskatchewan bills itself as the “Land of Living Skies,” and that was certainly true last week when I spent three perfect nights under some of the darkest skies in the country. 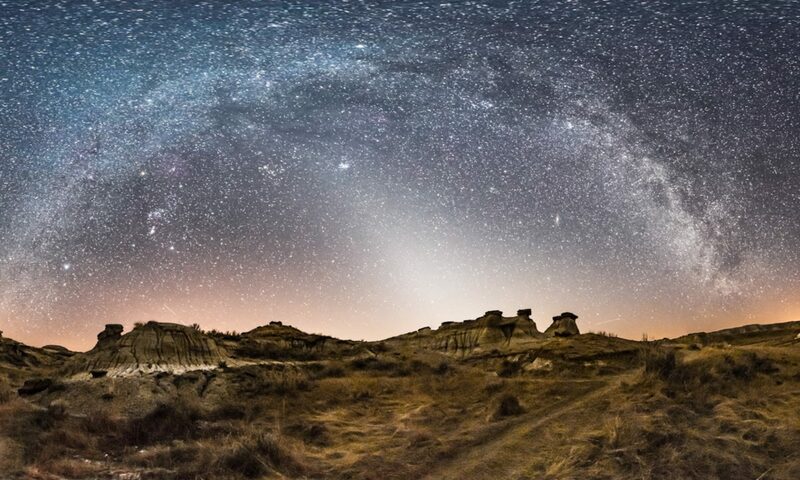 The location was the Old Man on His Back Prairie & Heritage Conservation Area, deep in dry southwest Saskatchewan, between Grasslands National Park and Cypress Hills Interprovincial Park, two favourite places of mine for nightscape photography and astronomy. The Conservation Area reclaims and preserves original short grass prairie habitat. 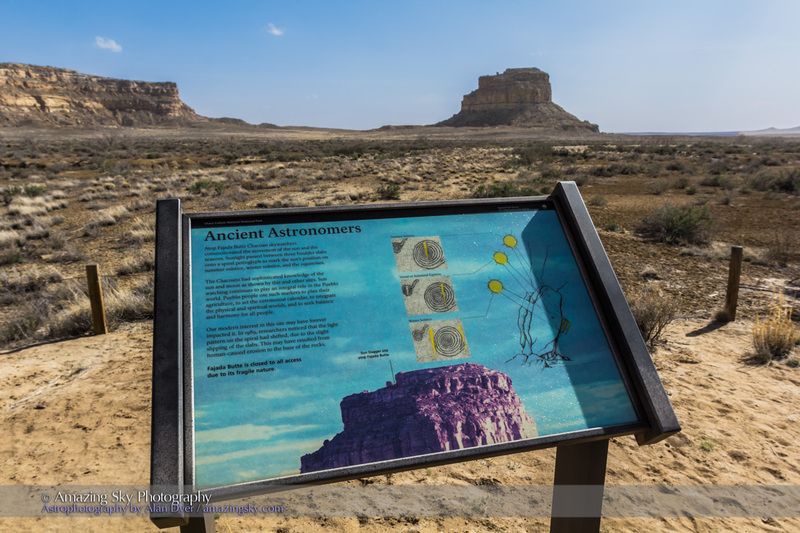 It is named for the formation to the west that is said to resemble the profile of Napi, the creator being of Siksika legends, who after creating the world, lay back here to rest. 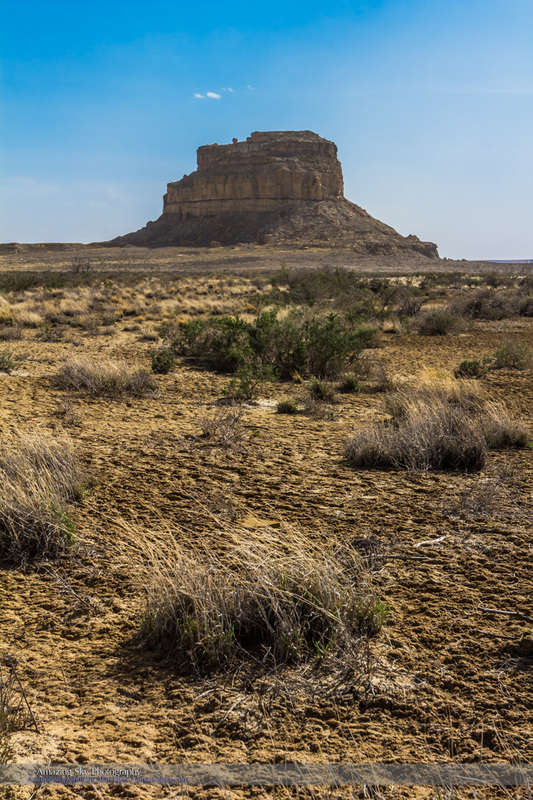 The land was once a working ranch first settled by the Butala family. The white pioneer house in my photos dates from that time. It was built in Montana and moved here in the 1920s. In the mid-1990s Peter and Sharon Butala transferred their land to the Nature Conservancy of Canada, to create an island of original prairie amid the heavily grazed land around it. 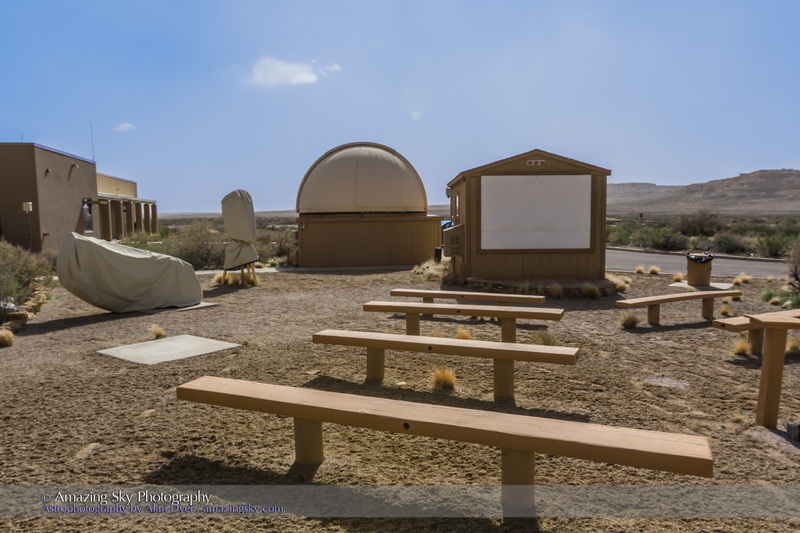 For astronomers, the Area serves also as an island of darkness amid intruding light pollution. The region is very dark, with few lights and manmade sky-glows on the horizon. My 360° panorama above shows that the greatest glows come from the arc of the aurora to the north and the arch of the Milky Way stretching across the sky. This is a stargazer’s paradise. My 2-minute compilation of time-lapse videos and still images taken over three crystal clear nights attempts to capture the wonder of the night sky from such a dark site. Be sure to enlarge the video to full screen to view it. It was in the little white house that Sharon Butala wrote some of her best-selling books retelling stories of her life on the prairie, notably The Perfection of the Morning, and Wild Stone Heart. A successful solar eclipse! Always a great thing to celebrate! 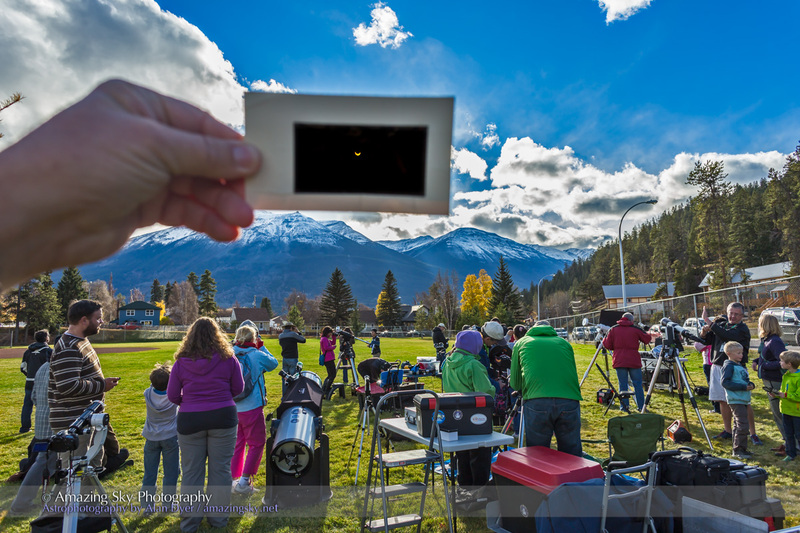 Today, several hundred people, including students from the nearby elementary and high schools, enjoyed views of the Moon eclipsing the Sun from Jasper, Alberta. The eclipse event in Centennial Park was part of the Park’s annual Dark Sky Festival, held to celebrate the National Park’s status as a Dark Sky Preserve. The photo above is a long 1/25 second exposure, though still taken through a solar filter, of the eclipsed Sun dimmed by clouds. 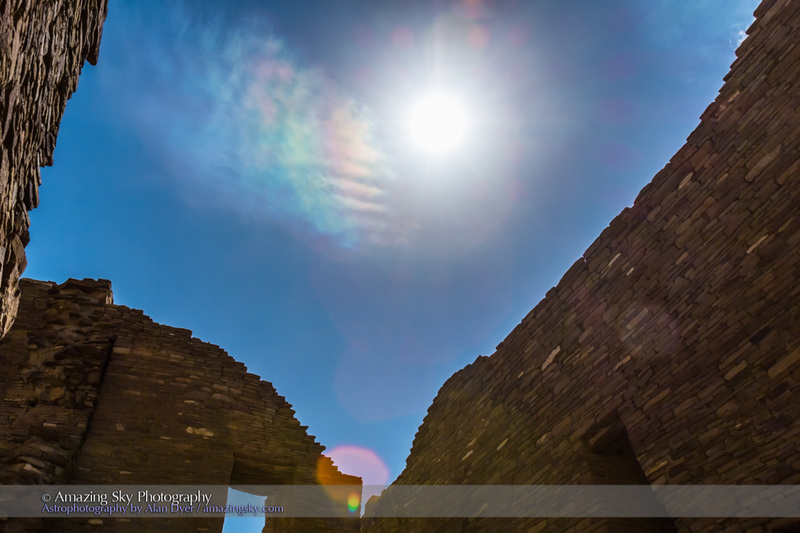 The longer exposure enabled me to pick up the clouds and iridescent colours around the Sun. 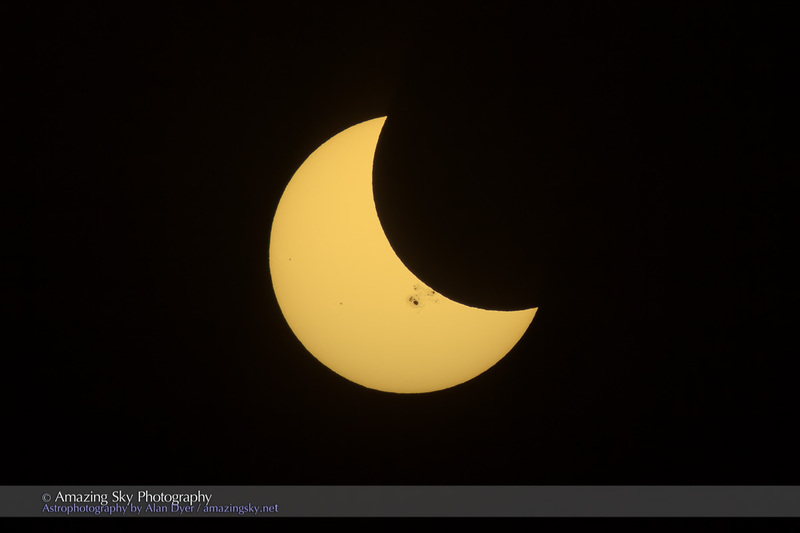 The photo below is a single exposure capturing the viewing through the many telescopes supplied by volunteers from the Royal Astronomical Society of Canada (Edmonton and Regina Centres), as well as capturing the crescent Sun, seen here though a handheld solar filter. Clouds came and went over the afternoon, but when they needed to be gone, clouds cleared off around the Sun for great views of the Moon hiding then revealing the giant sunspot that was the highlight of this eclipse. The image below, which I shot through a small telescope at 1/8000th second through a filter, shows the big spot group about to be hidden by the advancing limb of the Moon. This event was our last solar eclipse visible from most of Canada until the long-awaited “Great American Eclipse” of August 21, 2017, when the lunar umbral shadow will sweep across the United States, bringing a total eclipse to the U.S. and a substantial partial eclipse to Canada. It’s the day before the eclipse, and the skies are not clear! On Thursday, October 23 the Moon covers the Sun in a substantial partial eclipse. 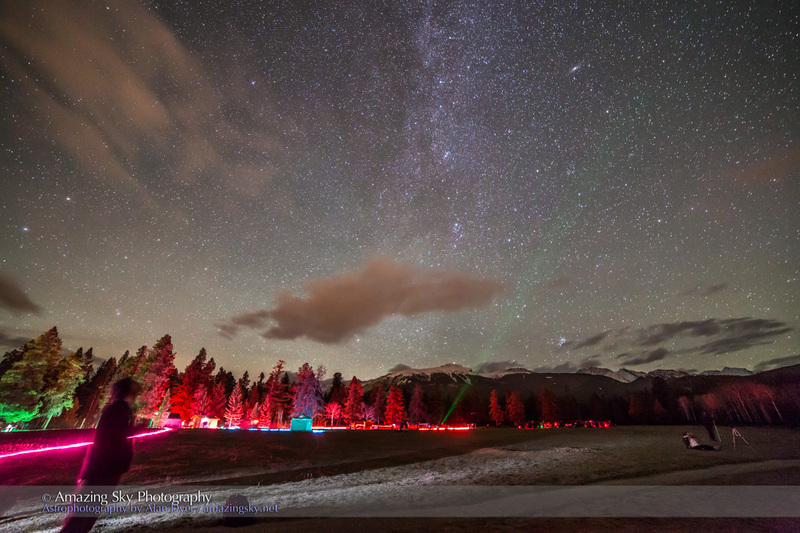 I’m in Jasper National Park, participating in the Park’s annual Dark Sky Festival. One of the events is a public viewing session of the solar eclipse. Let’s hope for some clearing skies and breaks in the clouds, so we can see 66% of the Sun eaten by the Moon! 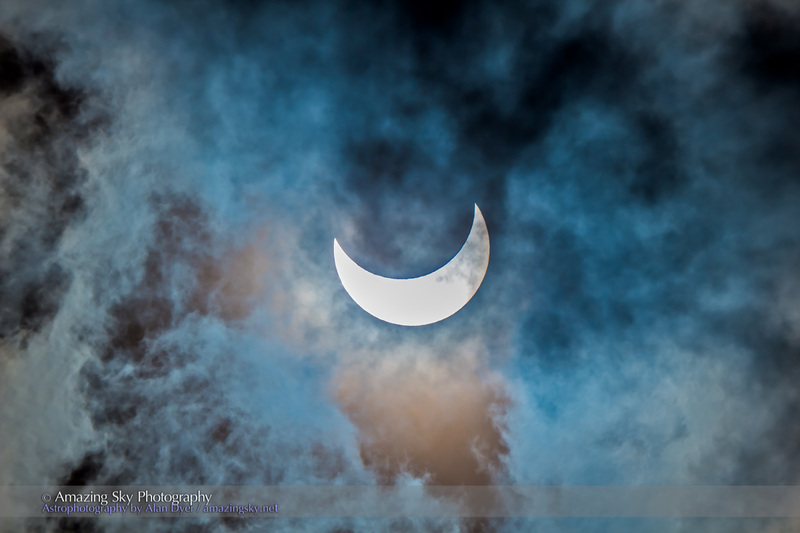 I shot this image at eclipse time the day before – today! – from a viewpoint looking west toward the Sun on the Icefields Parkway south of Jasper townsite. 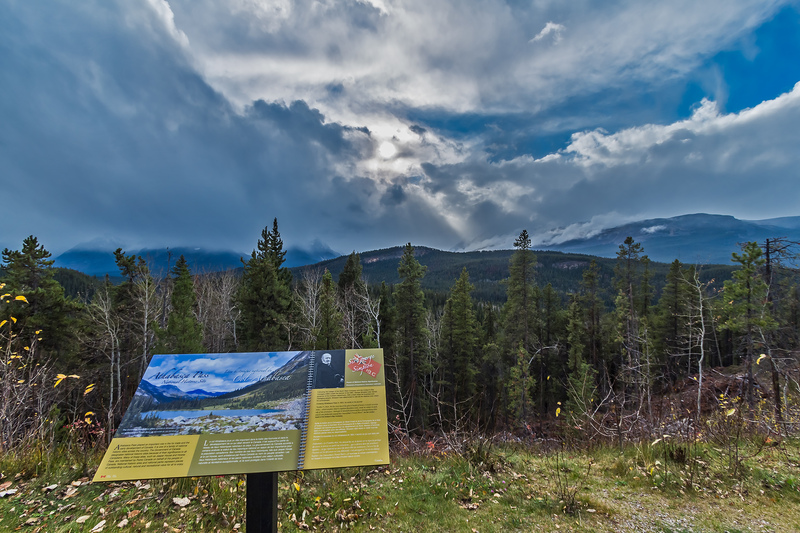 The Sun is trying to break through and is casting its beams down onto the famed Athabasca Pass, the route over the mountains pioneered by David Thompson in the early 1800s when his preferred route over Howse Pass to the south was blocked by the Pikanii who objected to Thompson trading with their enemies over the Rockies. I show the area of Howse Pass in this previous big post from earlier this summer. Thompson was one of the first astronomers in western Canada, using the Sun, Moon, Jupiter and stars to navigate his way and map the country. The lower sign explains. Click on the image for a larger view. 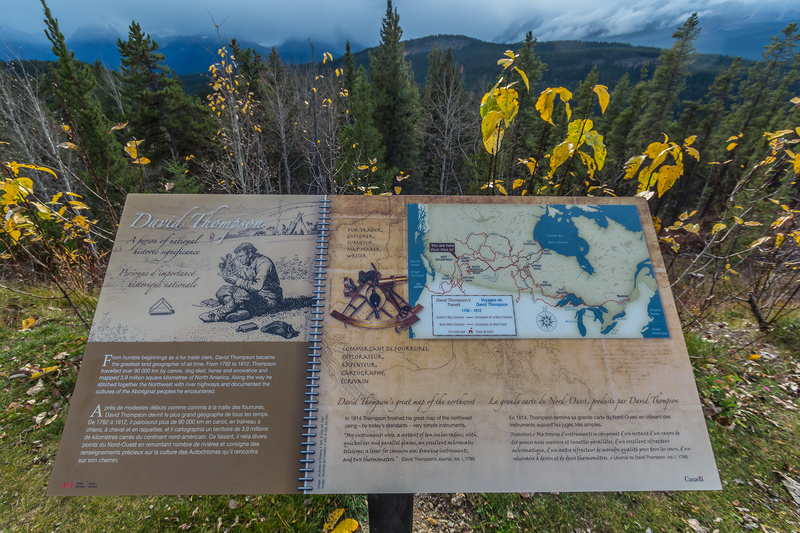 The Dark Sky Festival continues the tradition of stargazing in Jasper, a science Thompson depended upon in his travels.